Aim: To evaluate and compare the amount of debris and irrigant extruded quantitatively by using two hand and rotary nickel-titanium (Ni-Ti) instrumentation techniques. Materials and Methods: Eighty freshly extracted mandibular premolars having similar canal length and curvature were selected and mounted in a debris collection apparatus. After each instrument change, 1 ml of distilled water was used as an irrigant and the amount of irrigant extruded was measured using the Meyers and Montgomery method. After drying, the debris was weighed using an electronic microbalance to determine its weight. Statistical analysis used: The data was analyzed statistically to determine the mean difference between the groups. The mean weight of the dry debris and irrigant within the group and between the groups was calculated by the one-way ANOVA and multiple comparison (Dunnet D) test. Results: The step-back technique extruded a greater quantity of debris and irrigant in comparison to other hand and rotary Ni-Ti systems. Conclusions: All instrumentation techniques extrude debris and irrigant, it is prudent on the part of the clinician to select the instrumentation technique that extrudes the least amount of debris and irrigant, to prevent a flare-up phenomena. Various instrumentation techniques have been used in the past for evaluating the apical extrusion of the debris and irrigant, but very few studies are reported in the literature utilizing the Hand Protaper instrument design. A total of 80 freshly extracted human mandibular premolars with complete root formation were selected. Inclusion criteria: Single canal and apical foramen, length of roots approximately 21 mm, canal curvature between 0 and 10 degrees, and an apical diameter corresponding to a #15 K file. The presence of a single canal was determined by observing the teeth under a stereomicroscope, and digital radiographs in the buccal and proximal directions. The standard access cavity was prepared conventionally with a #10 K-file (Mani Inc, Japan). The file, with a rubber stopper, was carefully introduced into each canal until it was just visible at the apical foramen. The working length was determined by subtracting 1 mm from this measurement. The teeth in which the #10 K-file can just be seen through the apex and # 15 K-file that fitted snugly at the working length were selected for the study. 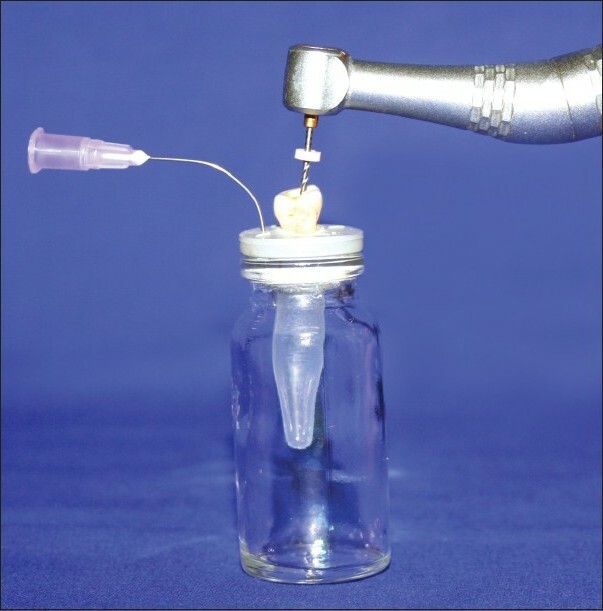 The debris and irrigant collection apparatus [Figure1] prepared was similar to that described by Meyers and Montgomery  The tooth was forced through a rubber stopper of the vial after standard access cavity preparation. A centrifuge tube was preweighed to 10 [-5] precision in an electronic microbalance (Single Pan K-Roy analytical balance, K-15) and placed in a 7 ml vial. The rubber stopper with the tooth was then fitted into the mouth of the vial. The samples were equally divided into four groups for instrumentation with different techniques. Group I - The teeth in this group were instrumented with the step-back technique. The procedure was divided into two phases: The Phase I apical preparation was started at the apical constriction. The Phase II preparation of the remainder of the canal was gradually stepped back, while increasing the instrument size. Group II - Instrumentation was carried out with a Hand Protaper, a set of six instruments were used: three shaping files (Sx, S1, and S2) for a crown-down procedure and three finishing files (F1, F2, and F3) for apical shaping. Group III - Instrumentation was carried out using the K-3 Rotary Ni-Ti Technique. The canals were prepared with a 0.12 taper K-3 instrument to resistance followed by a 0.10 taper and 0.08 taper instruments. The canals were further prepared with a 0.06 taper with #45 K-3 instruments to resistance, from the largest instrument to the smallest, reaching the working length. After a middle third scouting with #10 K-files, #40, #35, and #30 K-3 instruments were used in a crown-down fashion up to the working length. Group IV - Instrumentation was carried out with a Rotary Protaper. After achieving a straight line access, a smooth glide path was achieved with a # 10 or # 15 K-file, which used up to two-thirds of the working length. The S1 shaping file was used and moved apically 3 mm short of the working length. The Sx files were then used sequentially until resistance was encountered (4 - 5 mm from the working length), followed by S1 and S2, to the working length, for shaping of the coronal two-thirds of the canal. Using F1, F2, and F3 files sequentially to the working length, finishing of the apical third was carried out. During root canal instrumentation 1 ml of distilled water was used after every change of instrument. The apex was prepared with a #30 file in all instrumentation techniques. Immediately after canal instrumentation, the centrifuge tube was removed from the vial and the volume of the irrigant was measured following the method given by Meyers and Montgomery. A calibrated centrifuge tube was filled with saline and compared with the experimental centrifuge tube. Each tooth was removed from the centrifuge tube and the debris adhering to the root surface was collected by washing off the apical area of the tooth with 1 ml of distilled water into the centrifuge tube. The centrifuge tube was stored in an incubator at 68°C for five days, to allow the moisture to evaporate, before weighing the dry debris, using an electronic balance (Single Pan K-Roy analytical balance, K-15). The measurements obtained were statistically analyzed. Data regarding the volume of the irrigant and weight of the debris extruded are presented in [Table 1] and [Table 2], respectively. The results indicated that all the instruments tested caused a measurable apical extrusion of the debris and irrigant. The hand instrumentation techniques (Step-back and Hand Protaper techniques) extruded more debris and irrigant when compared with the engine-driven K-3 and Rotary Protaper systems. The step-back technique showed the greatest extrusion of both irrigant and debris, and there was a statistically significant difference (P < 0.05) found between the step-back technique and other hand and rotary Ni-Ti instrumentation techniques. The K-3 system extruded significantly smaller amounts of irrigant and debris. Shovelton DS,  Seltzer and Naidorf,  and Sequiria  have reported that bacteria are also extruded along with debris through the apical foramen. The number of bacteria extruded apically has a direct correlation with the weight of the debris (quantitative factor); and the type and virulence of the bacteria is related to the severity of the periapical inflammation (qualitative factor). Mangalam S et al and Reddy and Hicks  reported that the difference in the root canal preparation techniques and the instrument design are the major causes for variations in the apical extrusion of the debris by different instrumentation techniques. The main objective of the present study was to assess the apical extrusion of the irrigating solution and dentin debris as a result of canal shaping by different preparation techniques and instruments. The methodology employed in this study has been described previously (Meyers and Montgomery). The amount and type of irrigant and the operator were common to all techniques. Elmsallati EA et al, reported that the file with short pitch design extruded less debris than the medium and long ones. Protaper, with a long pitch design of the instrument, extruded greater amounts of debris and irrigant compared to the K-3 system. Apical extrusion of microbes into the periradicular tissues during endodontic treatment has the potential to bring about serious systemic diseases, such as, endocarditis, brain abscess, and septicemia, particularly in compromised patients. Therefore, every effort should be made to limit the periapical extrusion of intracanal material during treatment, to prevent the flare-up phenomena. Hand instrumentation techniques (Step-back and Hand Protaper) extruded larger amount of debris and irrigant than the engine-driven techniques (K-3 and Rotary Protaper). The step-back technique extruded the highest amount of debris and irrigant, whereas, the K-3 system extruded the least. 1. Seltzer S, Naidorf IJ. Flare-ups in Endodontics: I Etiological factors. J Endod 1985;11:472-8. 2. McKendry DJ. Comparison of balanced forces, endosonic and step-back filing instrumentation techniques: Quantification of extruded apical debris. J Endod 1990;16:24-7. 3. Tanlap J, Kaptan F, Sert S, Kayahan B, Bayirl G. Quantitative evaluation of the amount of apically extruded debris using three different rotary instrumentation systems. Oral Surg Oral Med Oral Pathol Oral Radiol Endod 2006;101:250-7. 4. Vande Visse JE, Brillant ID. Effect of irrigation on the production of extruded material at the root apex during instrumentation. J Endod 1975;1:243-6. 5. Martin H, Cunningham WT. The effect of endosonic and hand manipulation on amount root canal material extruded. Oral Surg Oral Med Oral Pathol Oral Radiol Endod 1982;53:611-3. 6. Sequiria JF, Rocas IN, Favieria A. Incidence of post operative pain after intracanal procedures based on an antimicrobial strategy. J Endod 2004;28:457-60. 7. Gutierrez JH, Brizuela C, Villota E. Human teeth with periapical pathosis after overinstrumentation and overfilling of the canals: A scanning electron microscopic study. Int Endod J 1999;32:40-8. 8. Shovelton DS. The presence and distribution of microorganisms within nonvital teeth. Br Dent J 1964;117:101-7. 9. Seltzer S, Naidorf IJ. Flare-ups in Endodontics: I Etiological factors. J Endod 1985;11:472-8. 10. Myers GL, Montgomery S. A comparison of weights of debris extruded apically by conventional filing and canal master techniques. J Endod 1991;17:275-9. 11. Sequeria JF. Microbial causes of endodontic Flare ups. Int Endod J 2003;36:453-63. 12. Mangalam S, Rao CV, Lakshminarayanan L. Evaluation of apically extruded debris and irrigant using three instrumentation techniques. Endodontology 2002;14:19-23. 13. Reddy S, Hicks L. Apical extrusion of debris using two hand and two rotary instrumentation techniques. J Endod 1998;24:180-3. 14. Kustarci A, Akpinar KE, Sumer Z. Apical extrusion of intracanal bacteria following use of various instrumentation techniques. Int Endod J 2008;41:1066-71. 15. Logani A, Shaha N. Apically extruded debris using three contemporary Ni-Ti instrumentation systems ex-vivo comparative study. J Dent Res 2008;19:182-5. 16. Mounce R. The K3 rotary nickel-titanium file system. Dent Clin of North Am 2004;48:137-57. 17. Clauder B. Protaper NT system. Dent Clin of North Am 2004;48:125-34. Psimma, Z. and Boutsioukis, C. and Vasiliadis, L. and Kastrinakis, E.
Franco, V. and Tosco, E.